I've been meaning to tell you about it for a long time... but when it first started I was a new blogger and I just didn't think of mentioning it. Then I thought I'd bring it up here the next time it happened, but it's been a long time since I last indulged. Until now. I guess I need to tell you what I'm talking about. I hope you'll understand. Like all addictions, you start out with the softer stuff, but it so often leads on to something harder. Well, yarn addiction is no different. You start with knitting, or maybe crochet. You might join Ravelry. 'I can handle it' you say to yourself, but then you find you want to knit and crochet. Before you know it you suddenly want to dye or spin your own yarn, or maybe even... weave. Yep, that's my little confession. My name is Sandra and I'm a Weaver! It started slowly, almost two years ago now, when I came across a handwoven scarf on Ravelry and I was kind of taken with it. Then occasionally I'd see another, and another and before I knew where I was I was hunting then down and wondering how on earth they were made. Over the next year I looked into the 'how' and the 'whys' and slowly, began to learn more about what was involved. Eventually, after a whole year of looking, thinking, learning and browsing I finally took the plunge and brought myself a loom. A Kromski Rigid Heddle 16" Loom to be precise. I'm not sure why it took me so long really. Partly I guess because it takes a little while to get the hang of the lingo. 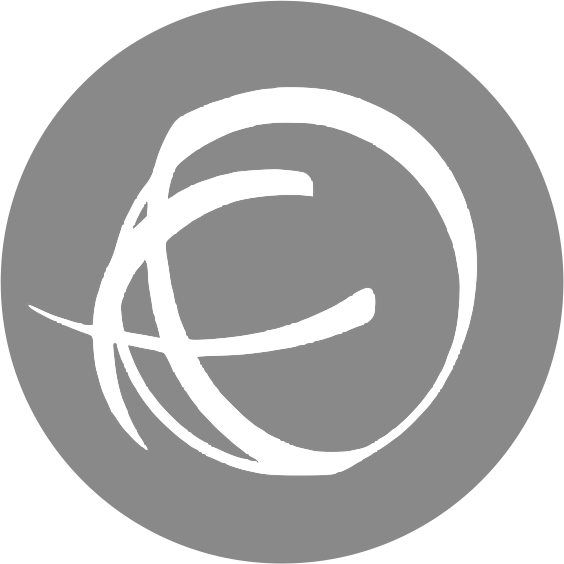 Warp, weft, heddles, sheds and shuttles were like a secret code to be decrypted at first. There's also the fact that there's no substitute for a 'hands on' type start to a craft. I was introduced to knitting in 'the flesh' by my Nan and family. Excellent for getting advice on where to start, what equipment you need and don't really need to get going. Not so easy with a more 'niche' craft. 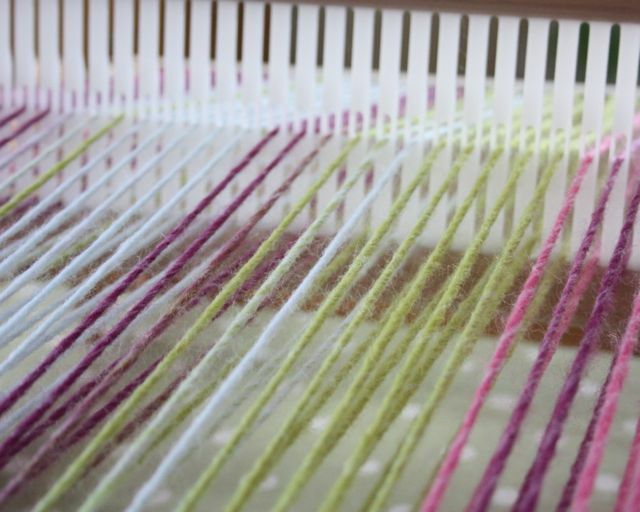 Luckily for me there are some very nice people lurking around the internet, especially on Ravelry and they were able to help me take my first, faltering steps into the mysterious world of weaving. My first project was just an experimental practise run really and so I just used any old spare yarn I had lying around. 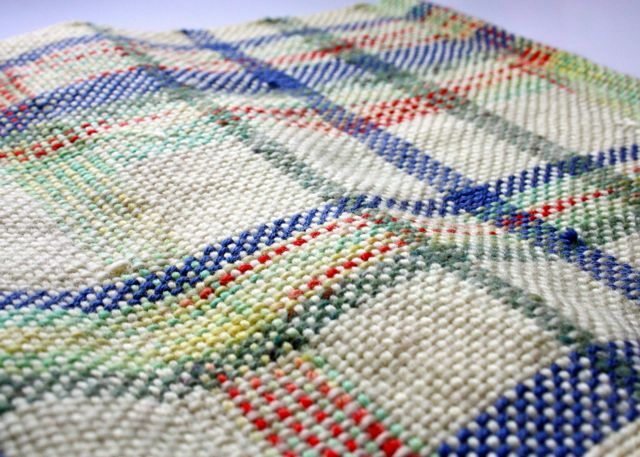 But it went well and I even got my 'selvages' (as us weaving people call 'edges') reasonably nice and tidy - not an easy task for the newbie! Once I had that under my belt, I went for something slightly more ambitious. This is my second project and I love how this one turned out. Then I didn't weave again for quite a while. But I had the idea recently of making a messenger bag from a woven fabric, so I selected some yarn (which looked absolutely fine together before I put it on the loom - promise!) and ended up with this. I've called this project 'Taste Fail' but some kind people on Ravelry have said they rather like it so maybe it's not the utter disaster I thought it to be. I still haven't made it into a bag yet though. I'm not sure, in all honesty that I ever will. Finally, this is my latest project. I brought this yarn (Wendy Fusion in Aniseed - I think it's discontinued now) ages ago and it sat in my stash because although I love the colours I didn't know what to do with it. 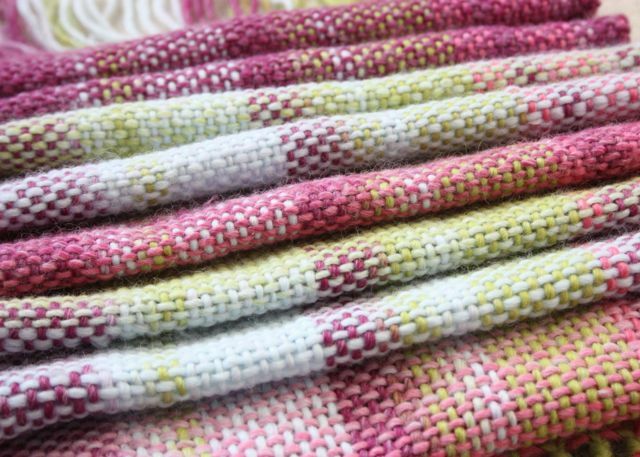 As mentioned before on this blog, I have some 'issues' with varigated yarns sometimes, but for weaving, I love it. It took me a long time to think of it, but I decided to weave it up and it worked a treat. I love how this one turned out. So there you are. Now you know my little secret! I am amazed by your work - and thank you for letting out your secret. The scarfs looks absolutely stunning!! My oh my, that looks gorgeous. Weaving is off limits for me, I already have many craft pleasures (knitting, crochet, clay, sewing). I do recognize the feeling that you start out humble. I started with crochet and acrylic yarn, but then I learned to knit and the acrylic was banned (although I still have a stash). I recently started dyeing my own yarn and what a bliss!! Have a nice weekend! ohh that is lovely. I want to have a go at weaving. Weaving is something I want to try too, one day. When I'm an old lady with loads of spare time. 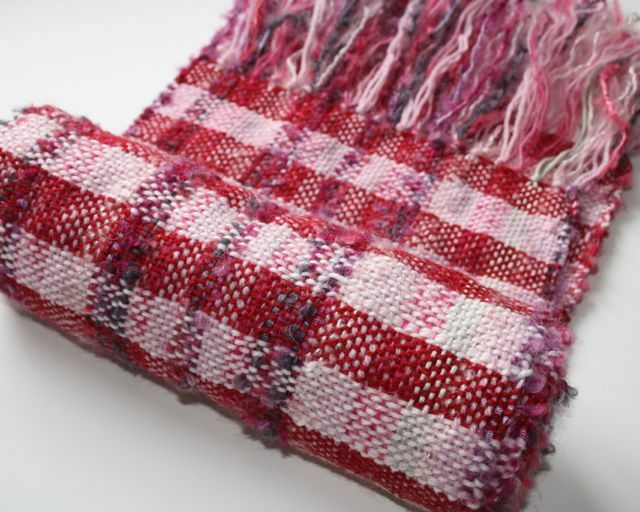 :) Your weaving experiments are really pretty, I love your last project. Wow! Everything you've done is beautiful! I was amused by your "confession". What a lovely craft. And your projects are beautiful...all of them. Why were you keeping this from us??!! That's a yarn craft I have never tried, but often admired. Can't wait to see what other tricks you have up your sleeve! Wow, I love ALL of these!! Absolutely gorgeous!!! Good grief, is there no end to your talents? That last scarf is gorgeous, as are the others, but the pink one is my fave! I love the candy colors you weave in, so cheery & beautiful! Great secret! Those scarves are amazing. I know just what you mean. I started with a bit of crochet, now I've moved on to knitting too, and in truth, now I keep looking at blogs about spinning and dying yarn... 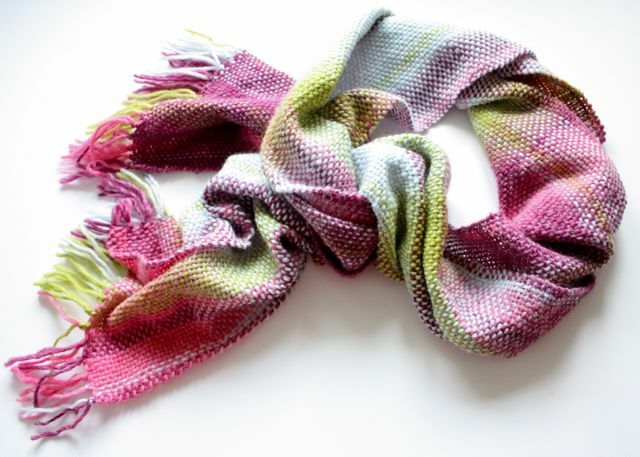 I love that scarf in pinks and green! The fabric is beautiful and I am a weaver,too. I have a very different type of loom, but I love it. Well I love anything to do with yarn. OMG! How wonderfully clever. Your fabrics are beautiful, they look so luxurious and the colours are stunning! Wow Sandra, thanks for coming out of the closet about your weaving skills! Your scarves are wonderful and I absolutely love your most recent creation, it's beautiful! Oooh Sandra, this is gorgeous! Wow! I love them all! And the last one... is simply magnificent! You don't know me, my name is Diemie and I'm from Holland. I've been reading your blog for a while now and I love your creations. 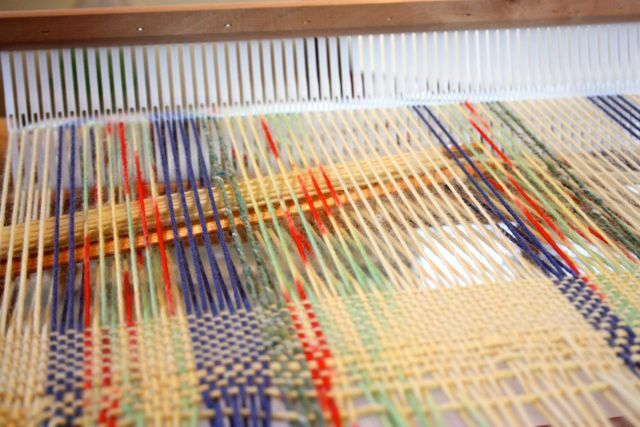 These pictures make me want to buy a weaving machine loom thingie ASAP! 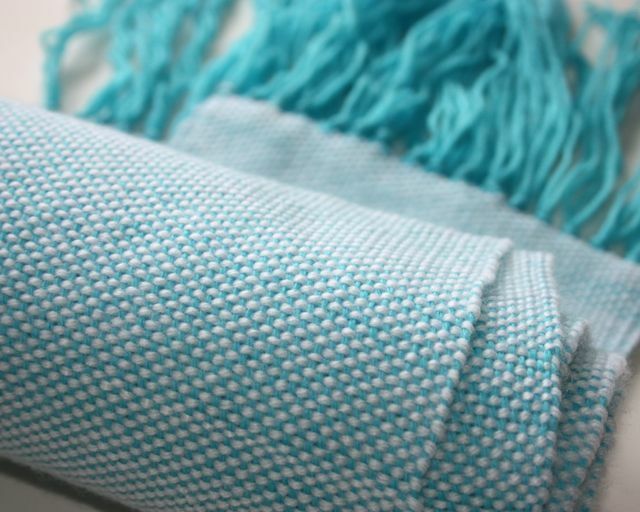 Ooh, that last scarf is perfect ... you've given me itchy fingers, I did a fair bit of weaving when I was at Uni, and I loved it, but I've woven nothing in all the years since. TENGO MUCHAS COSAS DE" MANOS DEL URUGUAY" EN PURA LANA Y UN COLORIDO PRECIOSO.